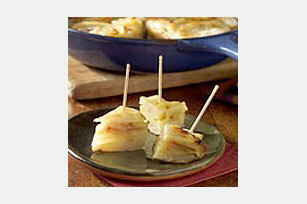 Here's an easy take on tortilla española, a potato omelet cut into cubes so it can be served the traditional way, with toothpicks. Heat 1/4 cup of the oil in 8- or 9-inch ovenproof skillet on medium heat. Add 1/3 of the potatoes; cover with layers of 1/3 each of the onions and garlic. Sprinkle lightly with salt and pepper. Repeat layers 2 times. Cook 5 minutes. Gently turn potato mixture over; cook an additional 5 minutes. Remove potato mixture from skillet; place in colander. Drain. Wash skillet. Preheat broiler. Beat eggs in large bowl. Add potato mixture; stir gently. Let stand 10 minutes. Heat remaining 1 Tbsp. oil in same skillet on medium heat. Add egg mixture; tilt skillet to evenly cover bottom of skillet. Reduce heat to medium-low; cook 2 minutes, gently lifting omelet occasionally to prevent it from sticking to skillet. Place skillet 4 to 6 inches from heat. Broil 10 minutes or until center is set and top is lightly browned. Gently cut around edge to loosen omelet from pan; slide omelet out of pan onto plate. Cut into bite-sized wedges or squares. Serve warm with toothpicks. Stir chopped kalamata olives, or chopped green or red bell pepper into the egg mixture before cooking.